Kula Baker has always lived on the edge of danger with an outlaw for a father. But now that she's grown, she's ready to go out into the world and make a respectable life for herself, where hopefully she'll catch the eye of a rich young man who will marry her. But when her father refuses to leave outlawing, saying that he has one last piece of business to take care of, Kula is forced to go alone...only to witness her father being arrested for a murder he didn't commit. Kula travels to San Francisco, hoping to find a man named Ty Wong and a mysterious box that will save her father...and ends up discovering long-buried secrets about her father she never expected. 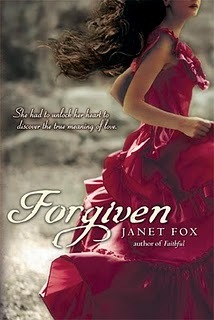 Forgiven is a fast-paced and unique historical novel, with a strong and noble protagonist. Kula is headstrong and determined to save her father, but a little naive in her methods. After a life slightly outside of the law, she's certain that marriage will give her the kind of respectability and security she craves. However, she is in for a few surprises as her romantic interests don't always go the way she plans and she falls for a Chinese man. Their romance seems a little rushed, but it is sweet and complements the more dangerous aspects of the novel as Kula searches for her father's box and in doing so, stumbles upon the darker side of turn of the century San Francisco with its human trafficking of female Chinese immigrants. That aspect, while horrifying, was a fascinating bit of history that Fox didn't expound upon nearly enough. The book ends with the great earthquake that shook the city in 1906, which hurriedly forced the book to conclude realistically, but slightly unsatisfactorily. Forgiven is a book that contains an interesting, complicated narrator and some fascinating historical tidbits, but as a whole seemed a little disjointed. The companion novel, Faithful, was a much better read. Cover Comments: I do love this cover, and how it captures the model in motion. And that dress is GORGEOUS! It does appear a little too romance novel-ish for my taste, but it is pretty. Tell me what you think about it! I was a little bummed--I liked Faithful a lot more! I haven't heard about this one before. Forgive is such a great unique historical novel and i really crazy to read the historical Novels most.So i like the whole story of it.